ABSTRACT: Understanding the process by which the cerebral hemispheres reach their mature functional organization remains challenging. We propose a theoretical account in which, in the domain of vision, faces and words come to be represented adjacent to retinotopic cortex by virtue of the need to discriminate among homogeneous exemplars. Orthographic representations are further constrained to be proximal to typically left-lateralized language-related information to minimize connectivity length between visual and language areas. As reading is acquired, orthography comes to rely more heavily (albeit not exclusively) on the left fusiform region to bridge between vision and language. Consequently, due to competition from emerging word representations, face representations that were initially bilateral become lateralized to the right fusiform region (albeit, again, not exclusively). In this talk, I will summarize empirical evidence from a variety of studies (behavioral, evoked response potential, functional imaging) across different populations (children, adolescents and adults, left-handers and individuals with developmental dyslexia) that supports the claims that hemispheric lateralization is graded rather than binary and that this graded organization emerges dynamically over the course of development. Perturbations of this system either during development or in adulthood provide further insights into the principles governing hemispheric organization. 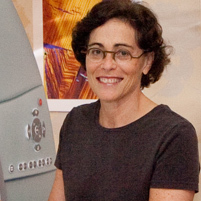 Dr. Marlene Behrmann is a Professor of Psychology at Carnegie Mellon University whose research specializes in the cognitive basis of visual perception, with a specific focus on object recognition. Dr. Behrmann received her B.A. in speech and hearing therapy in 1981, followed by her M.A. in speech pathology in 1984, both from the University of Witwatersrand in Johannesburg, South Africa. She then received a Ph.D. in Psychology from the University of Toronto in 1991. Dr Behrmann was inducted into the National Academy of Sciences in 2015. Dr. Behrmann is widely considered to be a trailblazer and a worldwide leader in the field of visual cognition.